What a wonderful opportunity we had as a company to feature artwork form Grace Slick, a true Rock & Roll icon. Her unique understanding of the world, as she sees it, is truly fascinating. As much as anybody, singer-songwriter Grace Slick is a part of Rock & Roll history. As a member of the Rock and Roll Hall Of Fame her iconic vibrato voice featured in both, Jefferson Airplane and Jefferson Starship with such songs as “White Rabbit”, “Somebody To Love” will be listed. Her legacy alongside her friend and contemporary Janis Joplin will go down as one of the most prominent female rock musicians of all time. Grace’s musical influences included Mick Jagger from the Rolling Stones and the Beatles. When Grace spoke of her other associations and experiences during perhaps one of the most creative musical times, it was like listening to someone who could not only talk of the history, but was a significant part of it. Reflecting back Grace reminisces, “my generation decided individually what was the way to go, we were talking about peace and freedom, trying to make an impact and alter the status quo, we were too naïve. For Grace her artwork brings her full circle, “I visited the de Young Museum in San Francisco when I was about four years old and was hooked ever since. Loved Rembrandt and other classics, don’t like modern art.” She uses acrylic paints, pen and ink, pastels and pencil. After retiring from music Grace began painting and drawing. Grace has had her ups and downs. As a youngster she was a fashion model. In her book: Somebody To Love? A Rock-and –Roll Memoir, Grace talks of her bouts with alcohol, LSD and Marijuana. But it never stopped her from pursing her dreams as musician, painter and author. As far as Grace is concerned when asked how the “revolution” is going 40 years later, “We are getting there – but still there’s a long way to go”. 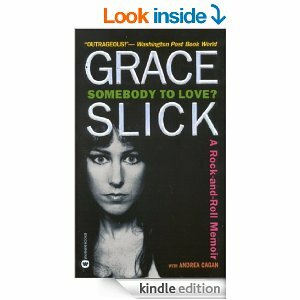 My questions to you as a reader: Can you relate to Grace Slick’s empowering thoughts and advice? Which one(s) will YOU follow on your career path?